At Audrey Would we are always on the lookout for unique vintage pieces, and when we find pieces that are Canadian vintage we are eager to learn more. 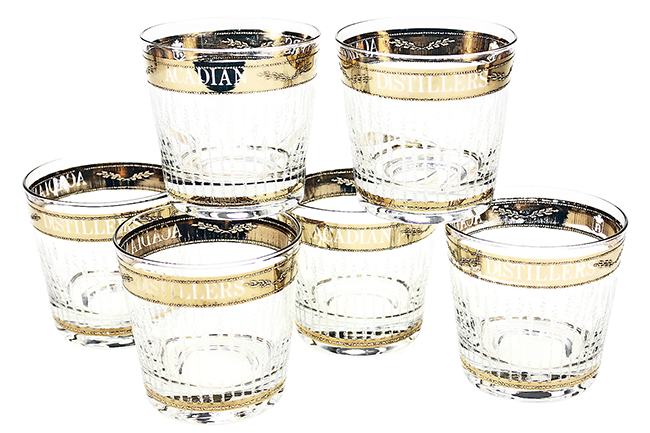 When these limited edition Acadian Distillers whiskey glasses were sourced I was advised they were Culver glasses. 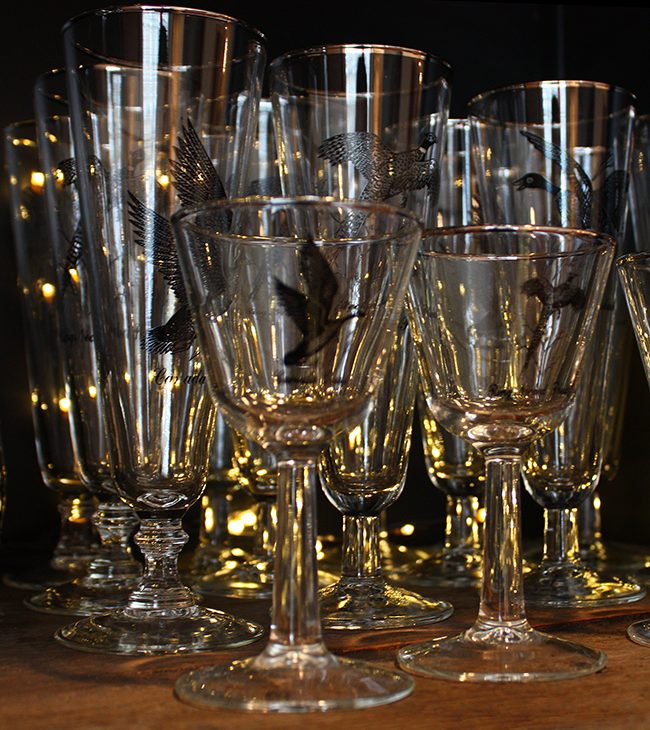 Culver Glassware, founded in Brooklyn, NY in the late 1930s, produced more traditional patterns earlier on until the late 1950s when they collaborated with Georges Briard to produce his gold screened patterns. 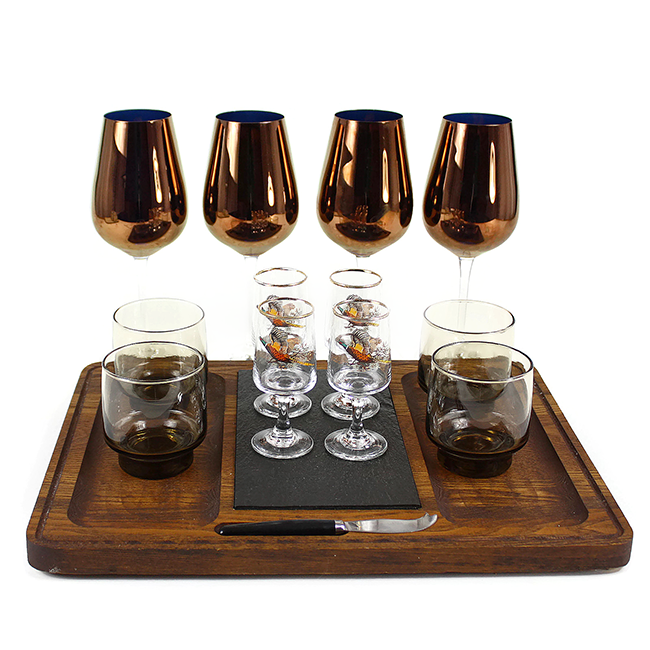 These Acadian whiskey glasses certainly fit a more traditional profile for what we now commonly connect to Culver style. 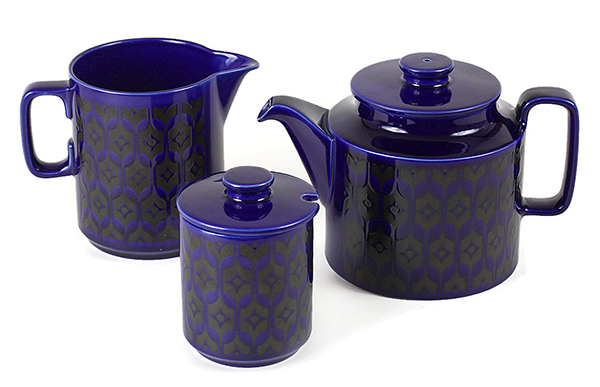 When Culver moved on from their work with Briard they began to produce more contemporary designs under the Culver label, and become known for their top secret process of heat firing highly decorative, thick, textured and opulent 22k gold patterns. 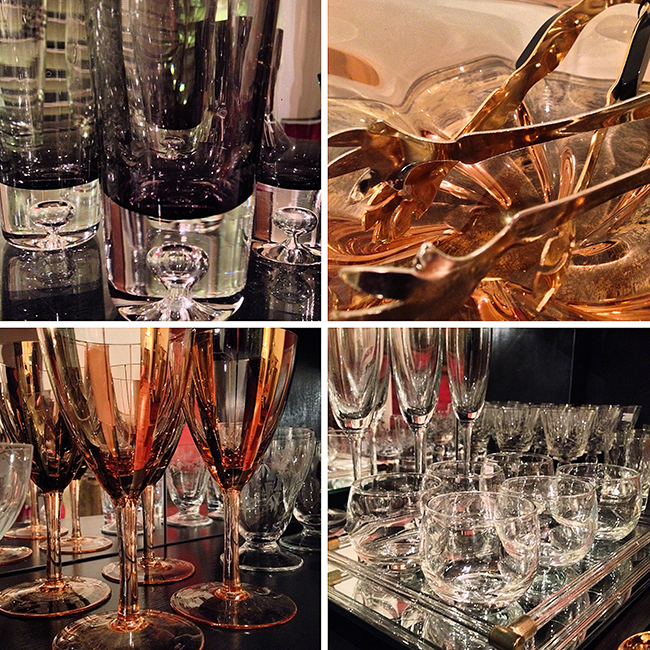 Culver’s designs gave ‘dripping with gold’ a whole new context in the world of glassware! 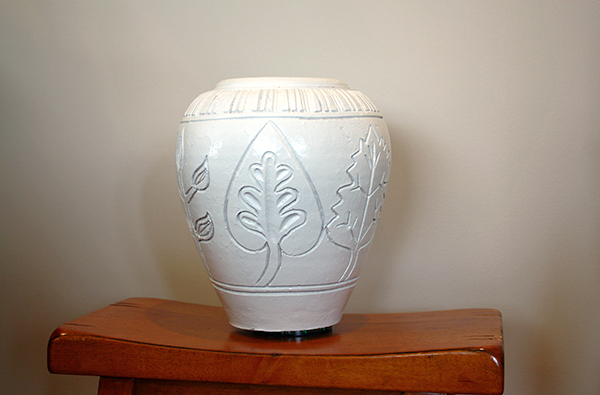 Here you see an example of a signed Culver piece in their very popular 1960s Valencia pattern. So how does Culver’s history and Acadian Distillers mesh? Well we know Culver’s earlier pieces are hard to identify as they were left unsigned, and we know Culver started producing gold embellished glassware in the late 1950’s. 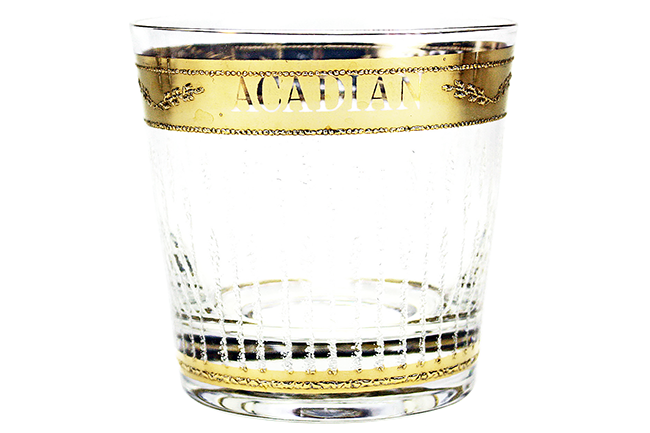 Acadian Distillers was founded in 1957, so it is quite possible that Culver created these limited edition glasses for the Distillery. 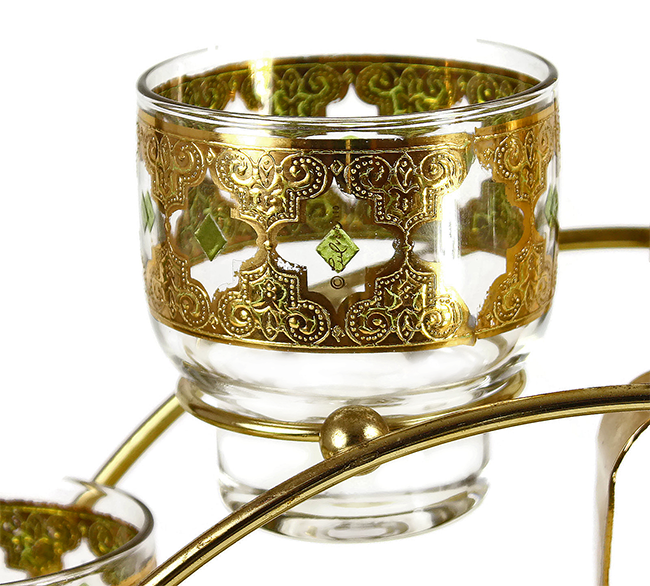 The decorative style to these glasses, especially in the raised 22k gold design feel very Culver. And… in the late 1960s Culver became ‘the’ designer of choice for the up-and-coming as a result of their Valencia pattern’s popularity. I think this quote captures the vibrant prestige of not only Acadian Distillery at the time, but why Culver would be ‘the’ choice to produce custom designed glassware for Acadian. However, I was unable to find any information to verify these glasses as Culver specifically… even in spite of the good fit! Do you know anything about Acadian Distillers? How about this collectible set? Find more information to purchase them here! All photographs by Sheila Zeller. Please link and credit if you choose to use! Did you know the once popular psychedelic spaghetti lamps of the retro 1960s-70s strung their style into cocktail glasses, too? That’s right. 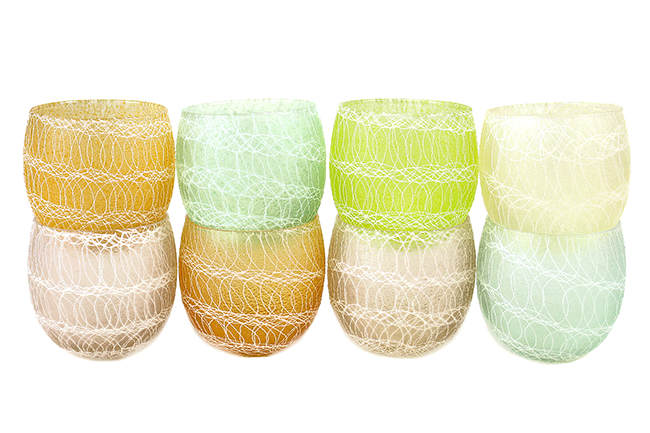 Coined ‘spaghetti string’ glasses, these vintage roly poly glasses are from the Shat-R-Pruf line made by Colour Craft Corporation out of Indianapolis. Shat-R-Pruf pieces were made of glass and coated with plastisol, a liquid form of vinyl cured by heat to set the shape. If you look closely at the rim of these rolies you can see the glass is clear. The actual colour is in the Tu-tone Plastisol, the first layer being the solid coating and colour, the second layer being the spaghetti string design. And… apparently these glasses will not stain or fade, and are dishwasher safe. I won’t argue with the manufacturer, but I have my own reservations about vintage treasures and dishwashers playing in the same game. I’ll leave that decision up to you! Whatever you decide, definitely do not prolong soaking – this will encourage the plastisol coating to peel… I’ve done this! 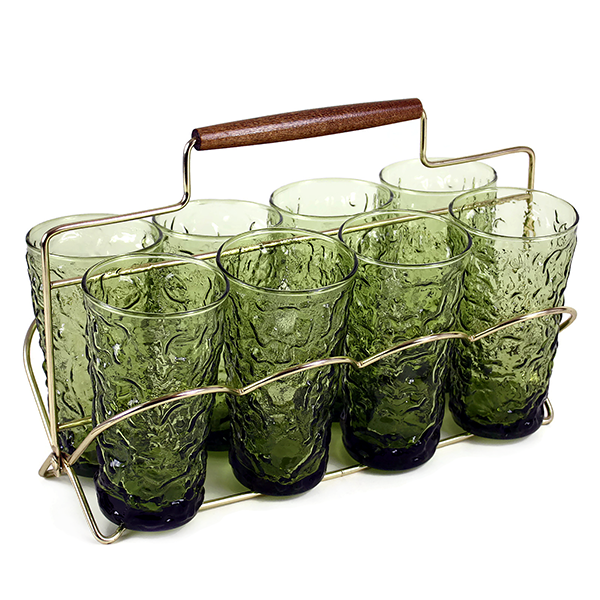 If you want to go retro but aren’t too hip on psychedelic swag, why not add this Shat-R-Pruf caddy set to your own barware collection? Interested… Purchase here. 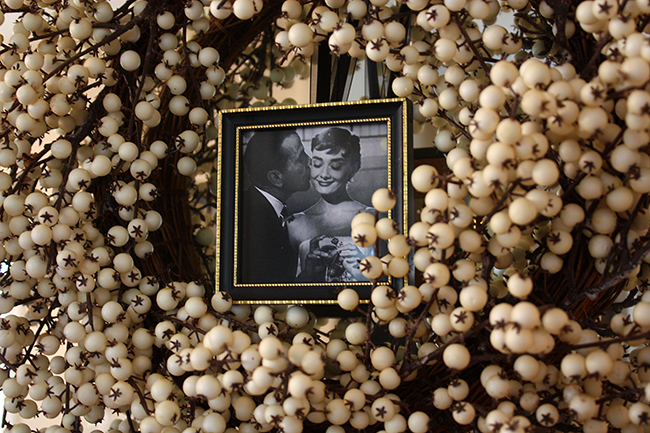 At Audrey Would! we think they are a fun-tastic find! It’s A Wrap… Have You Finished Your Shopping Yet? Audrey Would’s first ever Holiday Shopping event has come and gone, and I’m pleased to say was a well-rounded success! 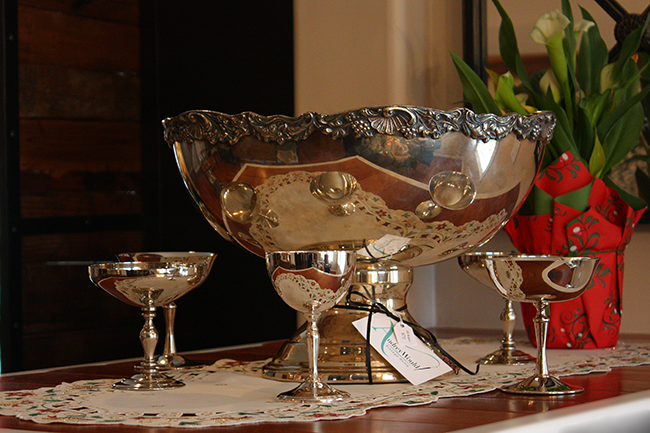 It was really nice to meet new faces, catch up with old friends and see some favourite vintage treasures find their way into the hearts of new homes. It’s not too late! You can still shop www.AudreyWould.com. Please feel free to contact me if you don’t see what you’re looking for. We might just have it, but haven’t got it listed yet. If you are local, I am happy to coordinate in-person delivery! 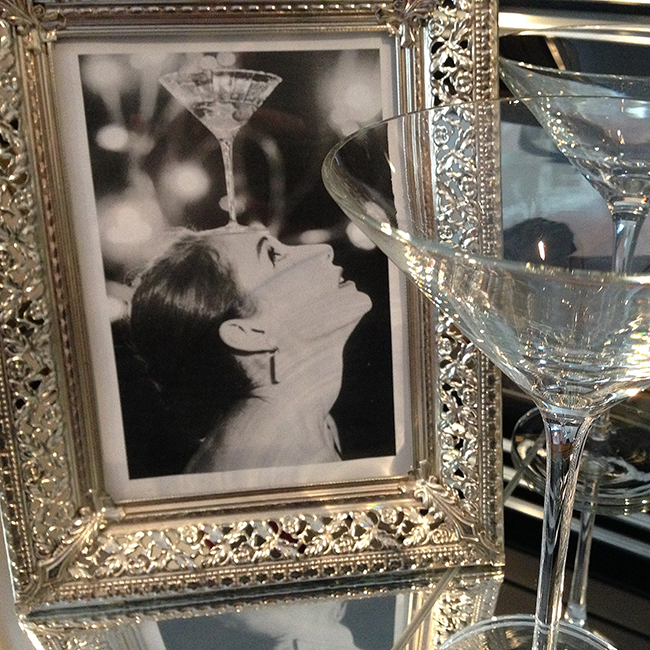 Sleek Vintage Chic in a Home Bar! 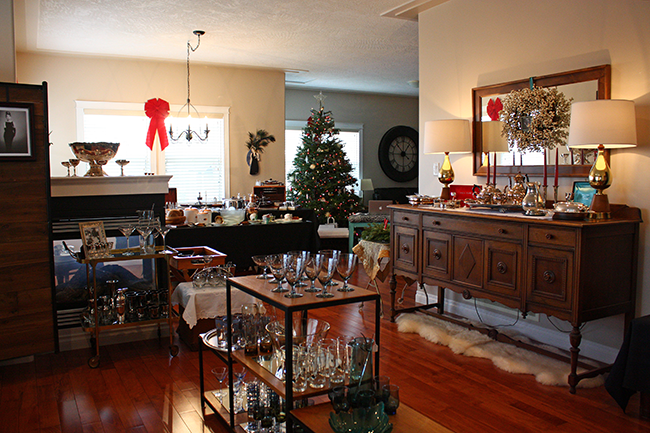 Chairish.com makes it fun and easy for design lovers to buy and sell pre-loved decor to one another. 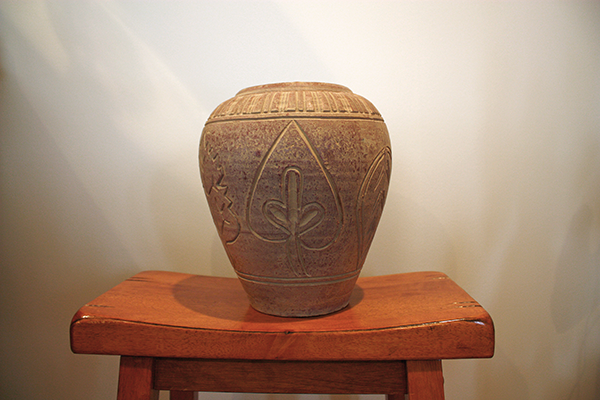 Our shop exclusively features curator-approved treasures in a full-service and trustworthy environment. I chose this set of barstools from the options Chairish provided. 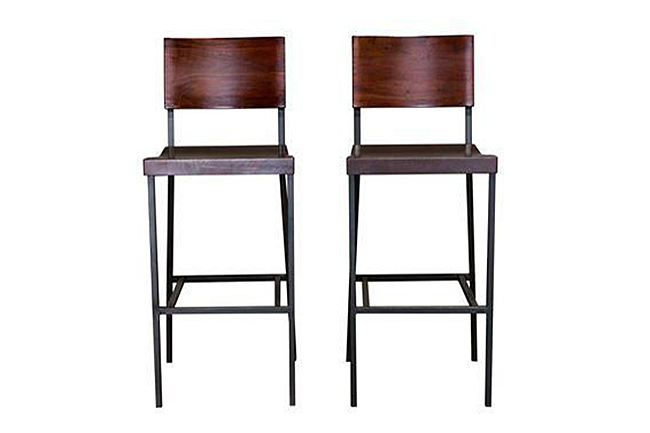 I love industrial chic, and with these handcrafted barstools I was drawn to the rich reddish-wood colour and metal frame combination. Another thing I like for a home barstool is a comfy back. Don’t get me wrong, there are fantastic sleek barstool options baring no back, but for a home bar comfort is key. Since we’re nearing the threshold of the Holiday Season, I went with grunge industrial chic meets ooh-la-la sleek! 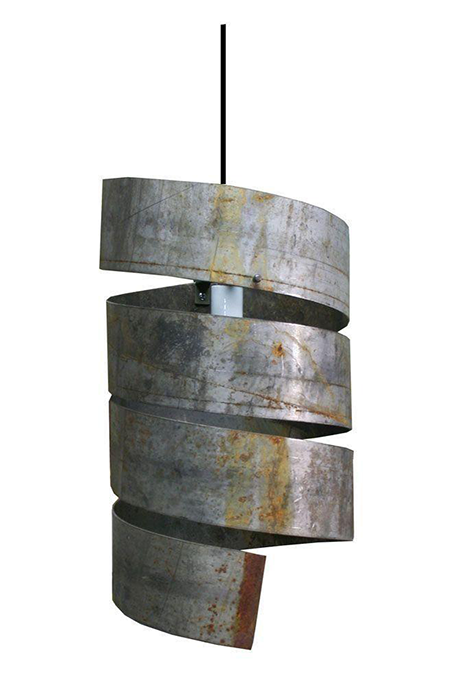 Love, love, LOVE these Chairish spiral pendants made from salvaged industrial-grade steel! I’m in favour of a great chandelier, but I’m partial to pendants for home bar designs. The problem is there are so many predictable pendants out there that have already been seen and done. It’s often hard to find something really distinct and unique. Normally I’m not one for area rugs in cocktail bar spaces, but for a home bar I like them a lot, and I thought this handmade vintage Turkish rug from Chairish was a perfect ‘grunge meets glam’ choice for my ideal home bar space! This rug was one of many left and forgotten in the back rooms of bazars, and believe it or not, it was at one time in traditional Turkish colours. 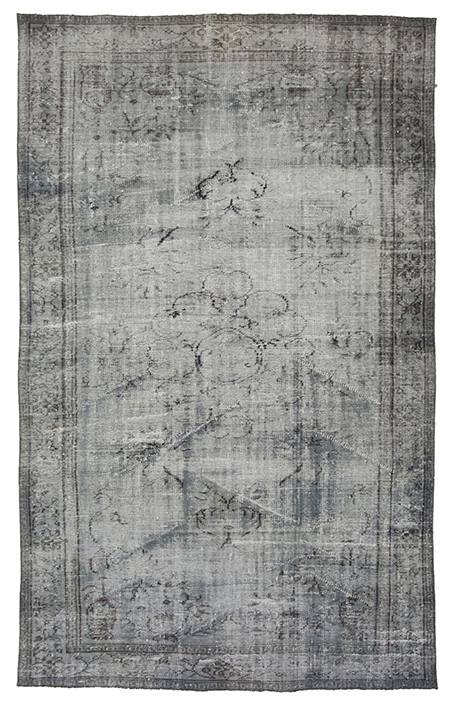 Through a process of overdyeing in today’s modern shades, this rug and many others have been revived and brought back into today’s style. 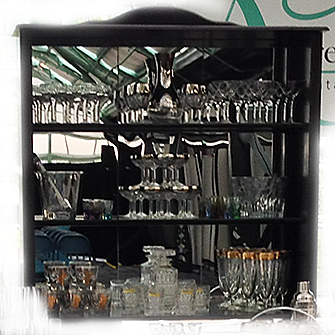 With the reddish wood colour of the barstools, and the cool shades of gray, I opted to pull in some sleek vintage barware from Audrey Would! 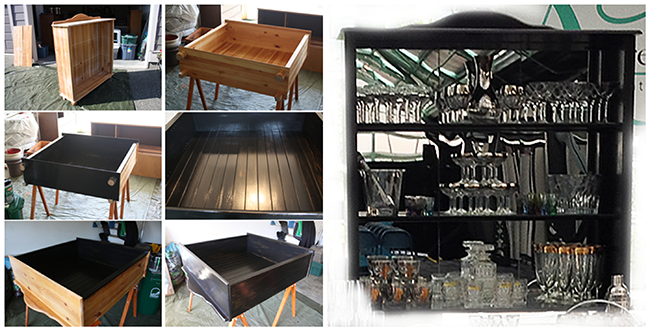 to complete this ideal home bar space. I liked the juxtaposition of rusty and worn to the sleek sparkle and bounce of light! And here is my style board where grunge meets chic! What’s your idea for an ideal home bar? Is it grunge, sleek and chic? Photographs for Chairish pieces taken from Chairish.com – click on image for direct link. All other photographs by Sheila Zeller. Please link and credit if you choose to use! 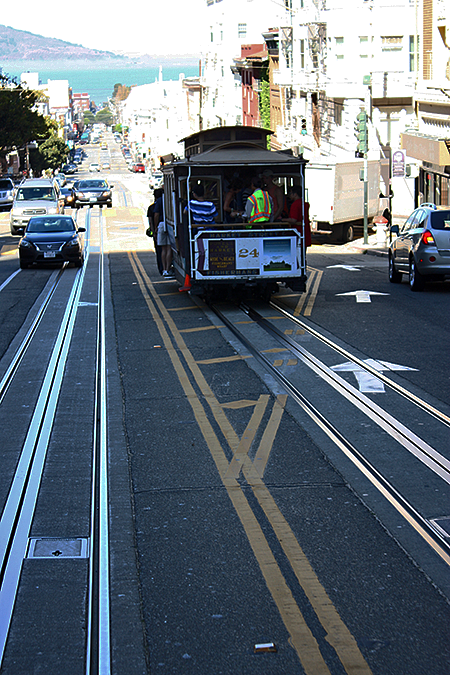 If you’ve been following along then you know I’ve been having fun in the sun in San Francisco this past week. And I can tell you, I now know first-hand why Tony Bennett sang about leaving his heart in SF – yes, I have fallen in love, too! Aside from atomic stars and bursts of the heart, one thing at the top of my bucket list was a little vintage shopping – are you surprised? Weirdly that proved to be a lot tougher than I thought – now I bet you really are surprised! I’m not kidding. Many of the vintage shops I set off to find ended up being closed, as in shut down, doors closed for good. #SoSad. The other truth is location. A lot of the shops were just too far out of reach geographically… but only for this trip 😉 . I also discovered that there are a lot of vintage clothing shops, amazing shops in fact, but not as many focussing on housewares and the treasures of Audrey Would! 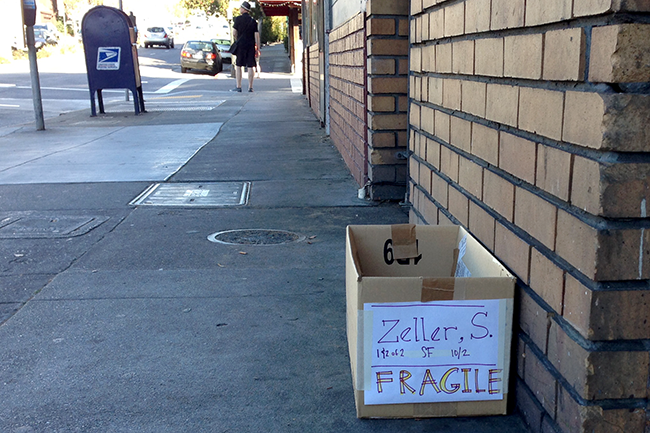 When I came upon this box on a little side street. 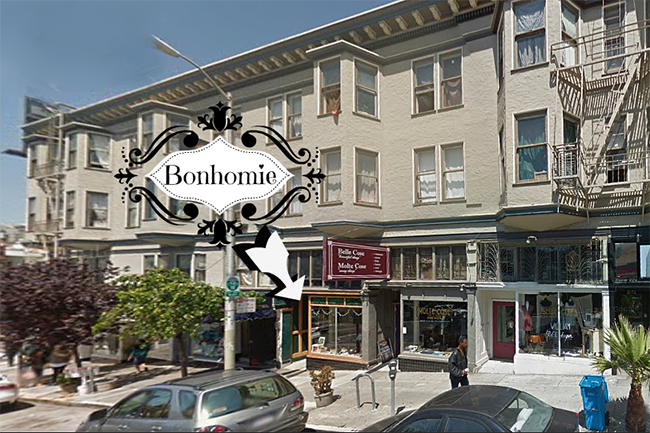 When we turned the corner, there in front of us was a little vintage boutique trio – Molte Cose (C-window), Belle Cose (R-window), and the one that caught my eye, Bonhomie (L-window) – all in a row staring at me! I have to preface, we have had a beyond incredible trip jam-packed with fun adventures, fab outings and memories we will cherish for a life-time, but is it wrong to say this little stumble was like finding 3 olives in my martini without asking? 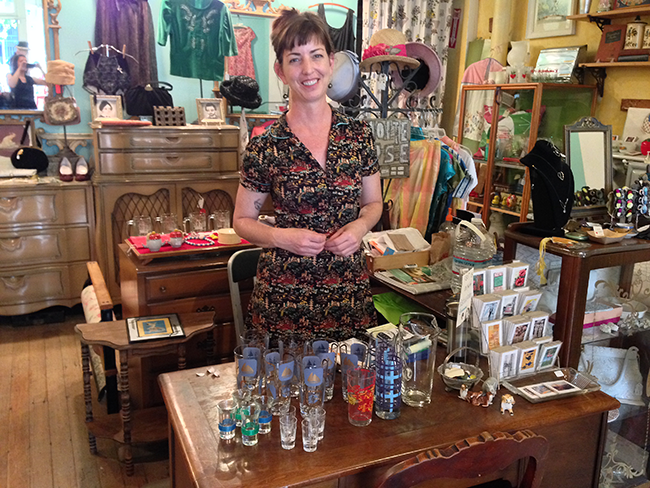 The shops were filled with beautiful vintage pieces – clothing, housewares and ephemera, and yes Audrey savvy stuff! We wandered and soaked in the offerings as if in a daze, each pass spying yet another something ‘new’. There were so many pieces that caught my eye, but in the end I had to be street smart in terms of not only transporting amazing vintage goods, but also moving them across the border and factoring in DUTY fees! 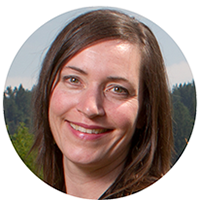 What I really loved about Bonhomie is its owner, Liesl (pictured above). When I asked if she would consider shipping the treasures I wanted to buy, she was so accommodating and willing to go the extra mile. That allowed me to pick up a few more pieces that would otherwise have stayed… and when packing up today, whew, am I ever glad she did! So as I sit in the San Francisco Airport waiting for my home-bound plane, I close this trip with a, ‘See you soon San Francisco’, and ‘Thank you, Liesl and Bonhomie’ for being the treasure I was missing in my San Fran mix! 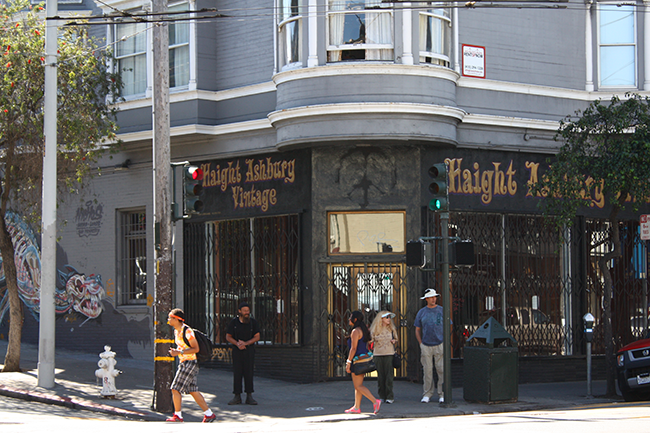 Have any of you been to San Francisco? Do you shop vintage, and if you do, what area should I be exploring next? I’ve been counting down to the 2014 Victoria Vintage Expo for months now, and I can’t believe it’s a mere 2 days away! Have you marked your calendar yet for this 2-day event? All the boxes for Audrey Would!’s booth are packed and ready to go. I’m working away from home right now, but I’ll get back on Thursday with just enough time to load up the vehicle and be on my way. 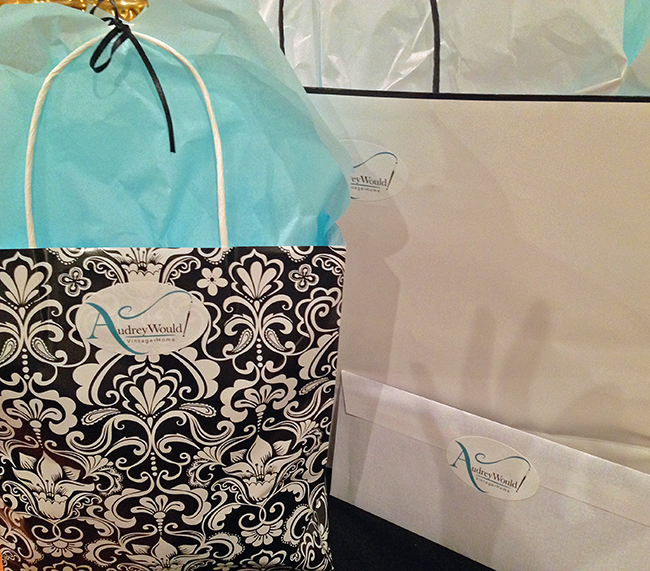 This is a sneak peek at one of the door prizes you could have a chance to win if you join us on Friday night. Are you up for entertaining your friends on a crisp, cool Fall eve? You will find Audrey Would! in Booth #38 at the top of the stairs (map here). See you there! (1) A pine bookcase that got Hollywood Glammed! 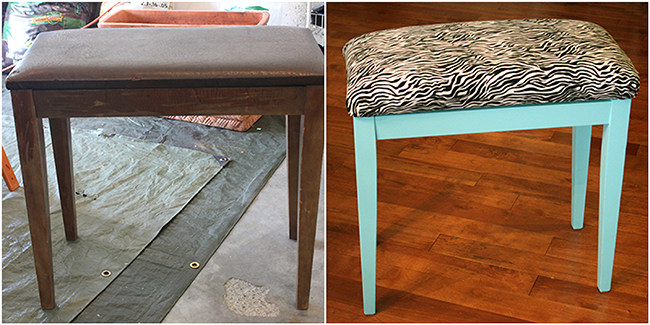 (2) A piano bench that jumped on the glam safari, too! 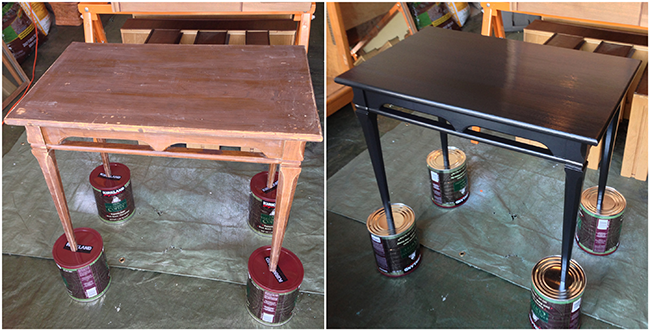 (3) And a little side table that was given a redo. This year Audrey will be back, top of the stairs again in Booth #38, and will have one more DIY prop to introduce. 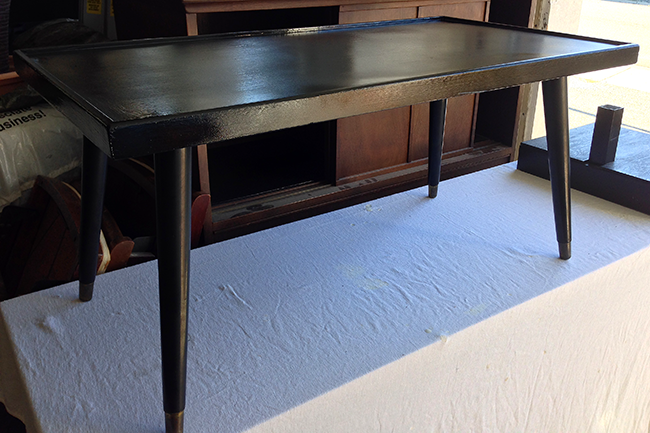 Then subjected it to the bliss of semi-gloss black paint! You will find this refreshed piece at the Vintage Fair among Audrey’s booth mix. 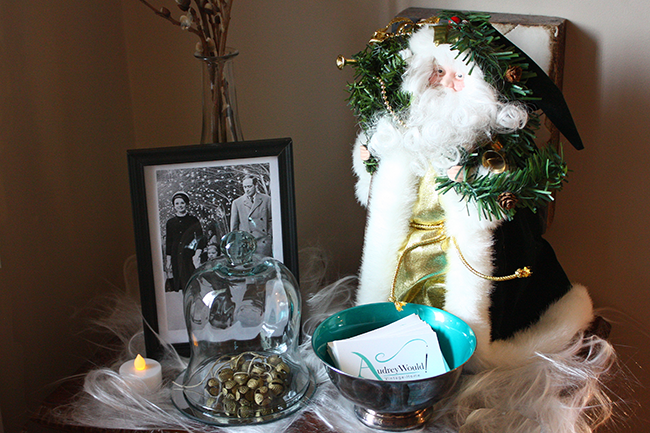 This year we have a few layout tweaks along with all the sparkle and glam of last year’s look. 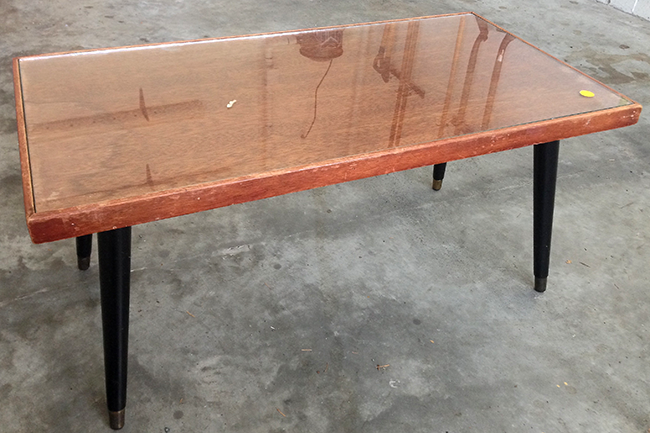 To see where this mod table fits why not drop by? Have you marked the dates? September 26 and 27 at the Crystal Gardens in Victoria – see you there! 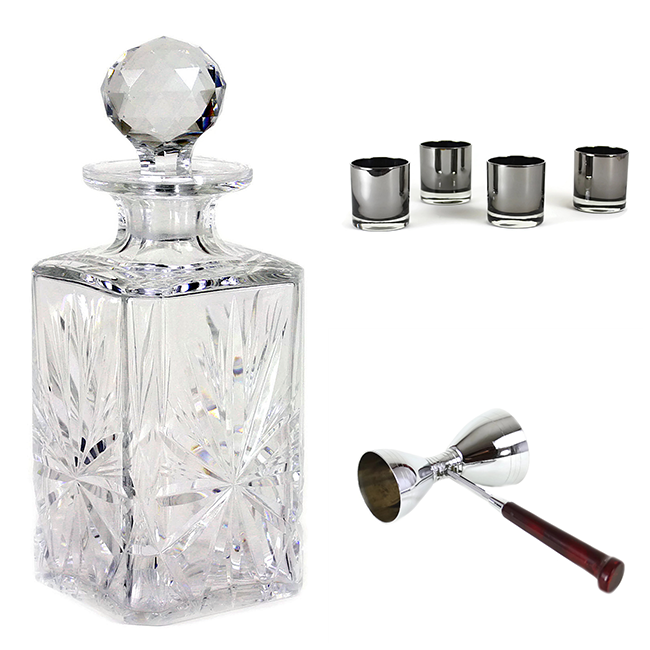 Basics for Entertaining Any Time, Any Day! Just like keeping a pantry cupboard stocked with staples, there are a few things I believe you should have on hand for low-key entertaining. 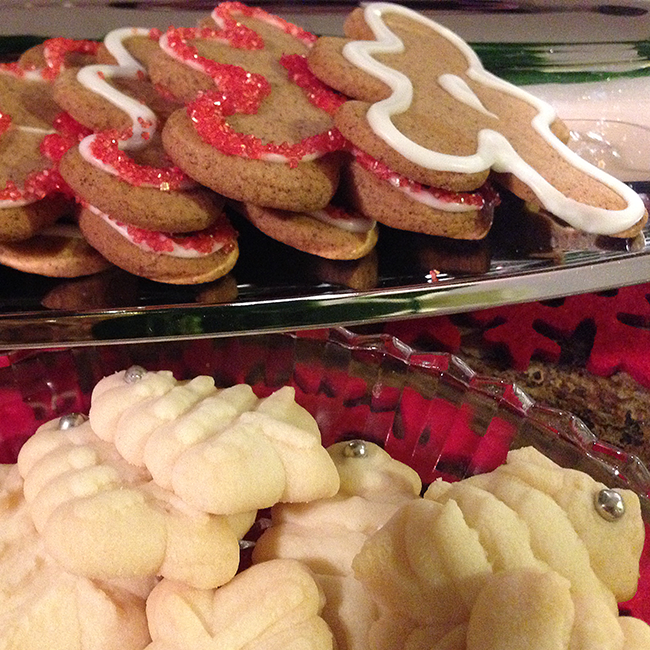 And by entertaining, I really do mean casual drop-ins, intimate gatherings, and just because! 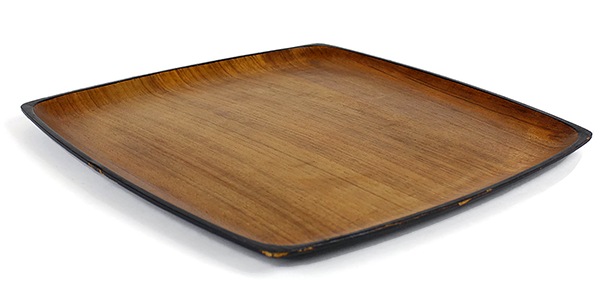 Every cupboard needs at least one tray, and I recommend going with a classic in either silver or wood like this vintage Contempo Teak tray from Japan. Once you have this basic in place you can always add to and expand your options. Whether you like cheese or not, let’s face it, cheese is a fundamental for almost every occasion. I bet your pantry is stocked with crackers, so take this one step further and add a cheese board to your cupboard essentials! 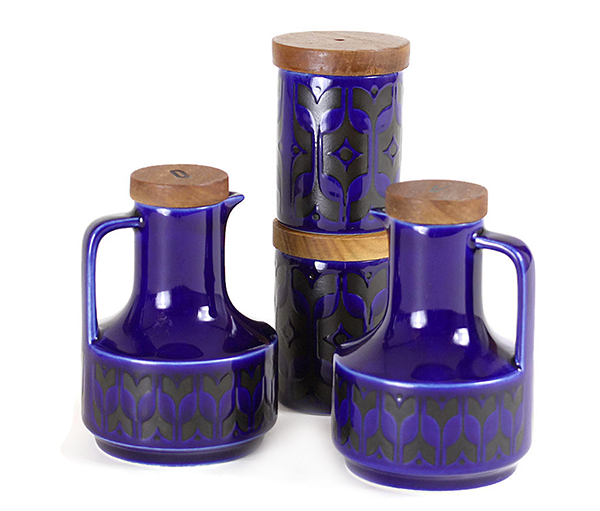 This happens to be a 1950s-60s Mid-Century option made by Swedish designer, Karl Holmberg. 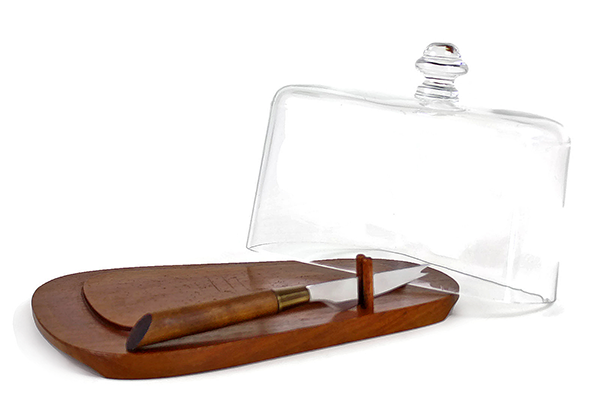 Yes, this would be a definite addition to your collection, but a vintage Baribocraft cheeseboard would be, too! 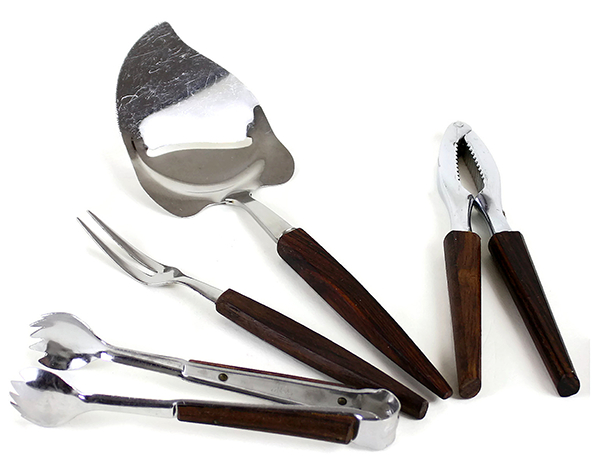 It’s all well and good to have great serving pieces, but don’t forget to add the finishing touch with out-of-the ordinary utensils like a few of the pieces in this wooden-handle vintage collection. 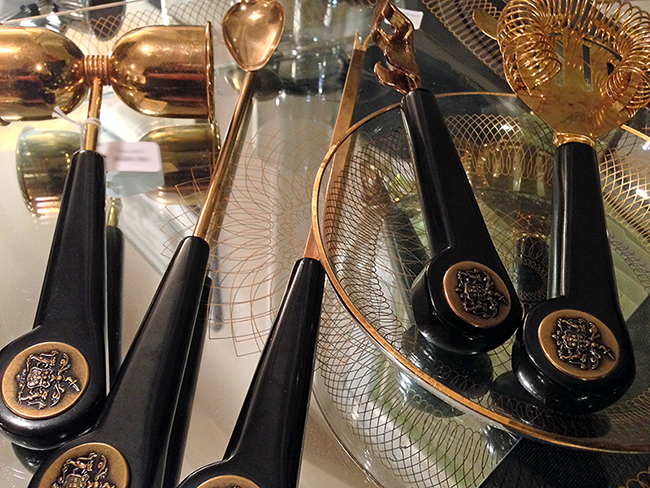 Included are a pair of sugar tongs, a medium-sized cocktail fork, cheese slicer and nutcrackers. Now, how much fun would setting out these pieces be? Whether you drink tea or not, I bet you know others who do, and having a teapot on hand is a must. This vintage Hornsea trio makes a small adjustment to the standard t, s & c set, and has paired the sugar bowl with a milk pitcher instead. 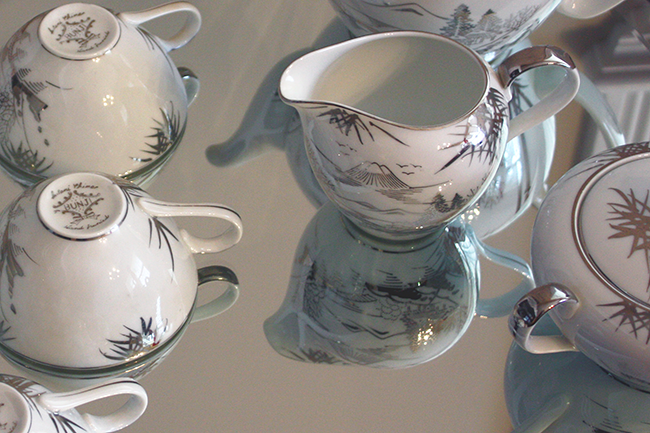 The pitcher is larger than a traditional creamer, which makes it a great piece to use for other purposes. I love this set! It goes without saying that at least one set of salt and pepper shakers is a predictable basic, but having a pair of oil and vinegar cruets is almost a second ‘must’. Making your own vinaigrettes is such a nice way to dress a salad, and keeping the base ingredients handy ensures you will always be prepped. 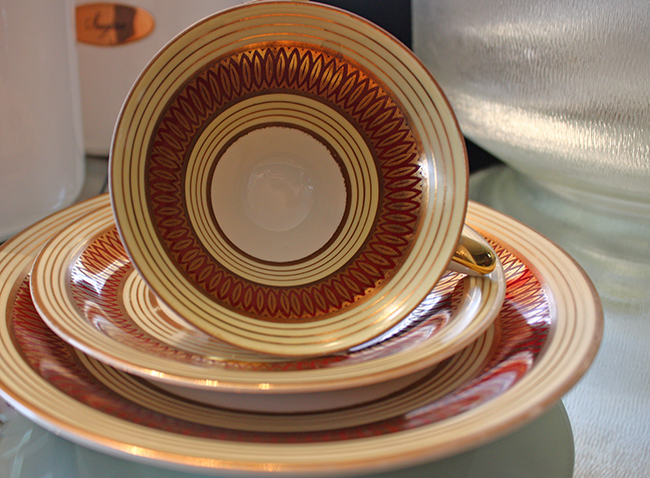 This 4-piece Hornsea set actually sits on a wooden tray. Pop over to the full listing to take a peek! These are just a few of the basics, but if you would like to join me for a cup of tea, I bet we can come up with a few more! What do you have in your cupboard that you wouldn’t want to live without? Photographs and Polyvore Set by Sheila Zeller. Please credit and link if you choose to use! Vintage Tumbler Caddy Set: All Crinkled Up! Summer is definitely here – is anyone else melting? This latest treasure find was just listed in Audrey Would! I am featuring it because it’s the perfect accessory for these crazy, hot days, and also because there is a little history behind the pattern name of the glasses. 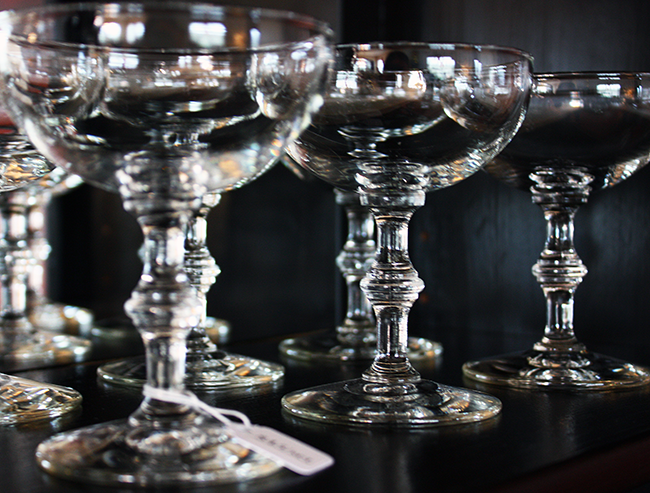 These glasses were made by Anchor Hocking in the mid-1960s. 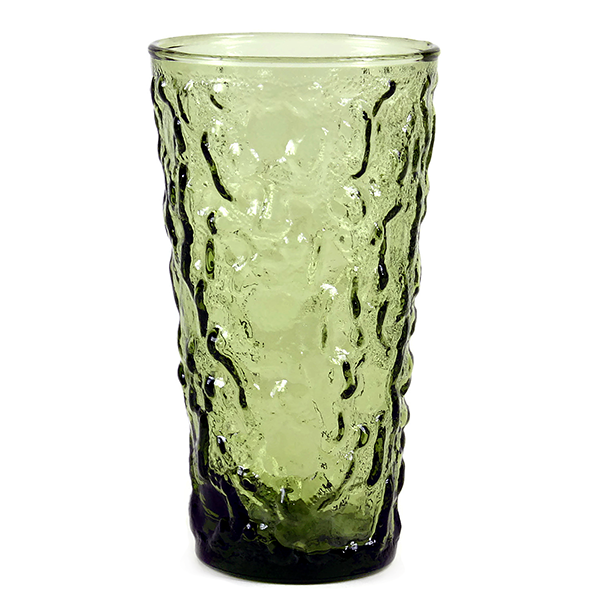 The pattern of this set is called Lido Glass, but the original pattern was introduced in 1959 as Milano Glass. 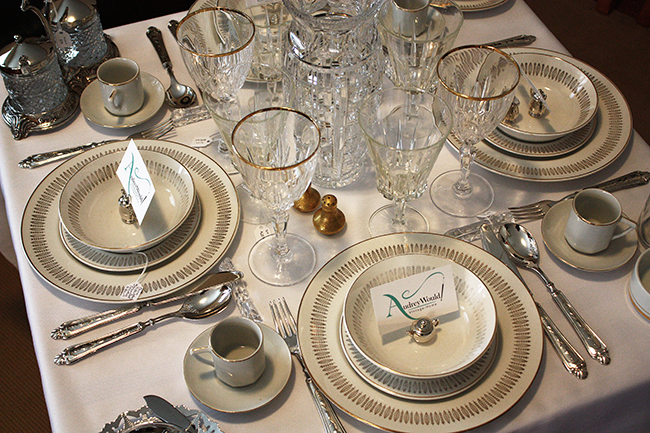 Production of the Milano pattern spanned 1959 to 1963, and was only produced in Avocado Green and Crystal (clear). Zanesville Mould Company, a new subsidiary of Anchor Hocking at the time, was assigned to making new Milano moulds to replace the old ones. As it turns out, the new moulds were quite different from the originals, which resulted in the pattern name being changed to Lido Glass. The two patterns are very similar, however the Milano pattern is more textured and the crinkle more defined. One way to tell a Lido piece from a Milano is that the Lido pattern does not extend right to the rim. Look closely at the glass below, and you will see a plain band around the rim where the pattern has stopped. 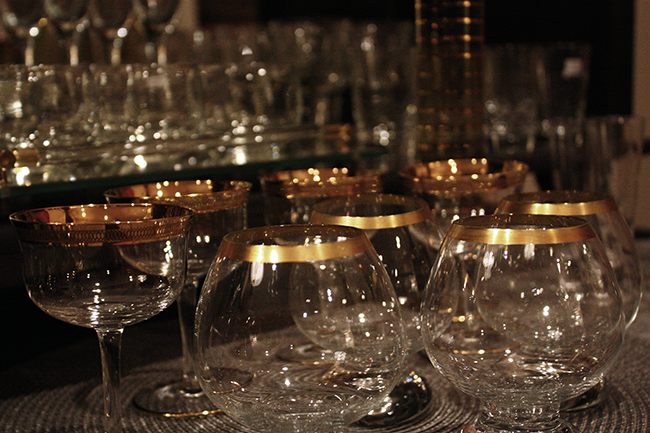 Lido Glass, like Milano, was produced in Avocado Green and Crystal, but it was also produced in Honey Gold, Spicy Brown, Aquamarine, and Laser Blue. 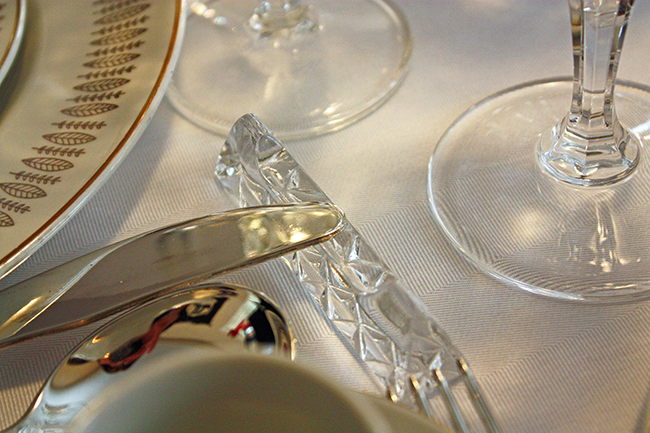 Crinkle glassware was popular at the time, and there were other companies producing their variation of this prevalent pattern trend as well. 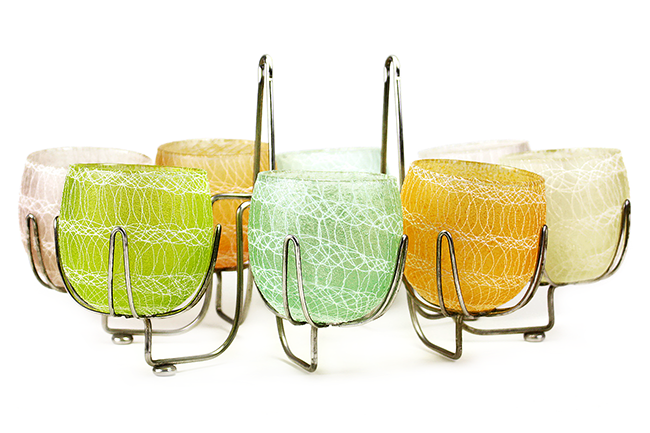 Morgantown Glass Company was one, but their Crinkle line has a distinctly different look. The tumblers are less uniform, and the crinkle is not as pronounced. In order to respect copyright, I could not share an image with you, but this link will take you to one. 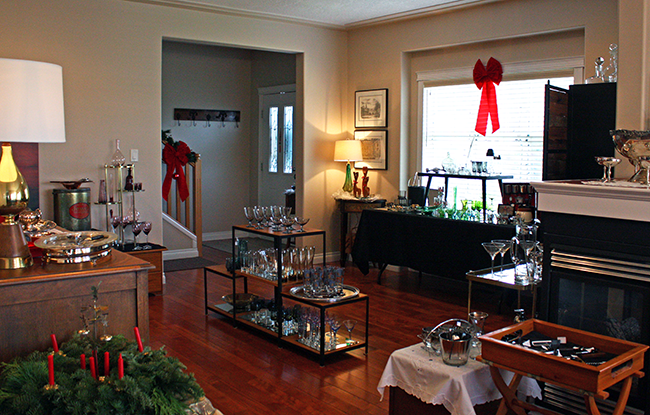 Seneca Glass Company with their Driftwood Casual line was another, see image here. So you can see it’s not always easy to tell one crinkle glass from the next, but now you have a few more tips to at least tell Milano and Lido apart from one another! 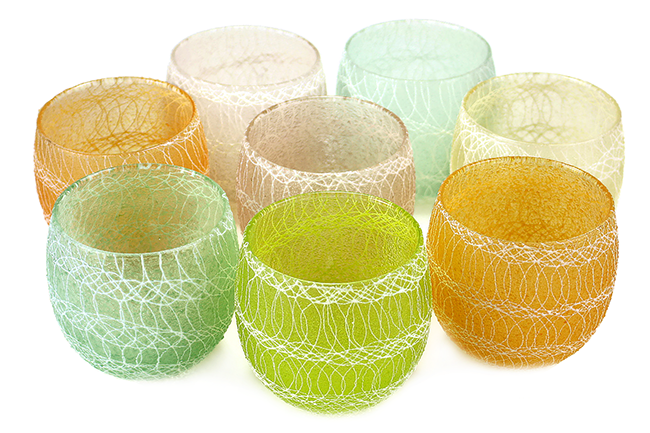 You know what I love most about this Lido crinkle glass set? It’s easy… just grab your caddy and go! 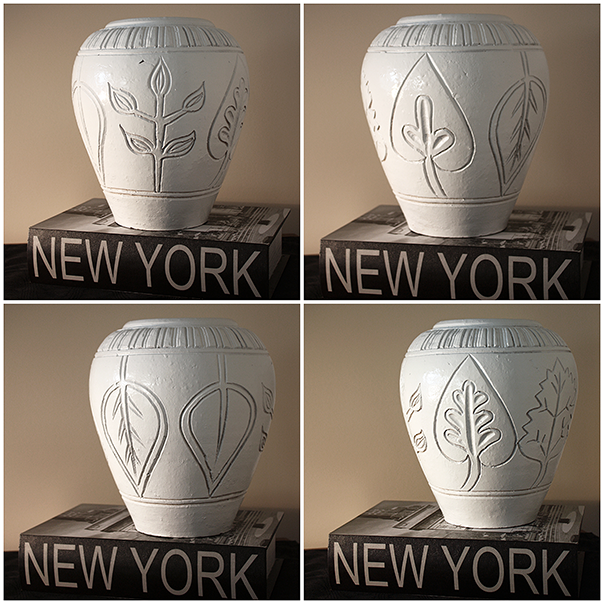 So you love Mid-Century vases – modernist – matte white porcelain, Kaiser, made in Germany circa 1960s. Are you okay with the ‘look for less’ concept? I am. You know I love my authentic MCM pieces, but I couldn’t resist this DIY temptation any longer! I bought this vase a million years ago when Superstore was a new phenomenon and I was enamored with a $7.00 price tag. 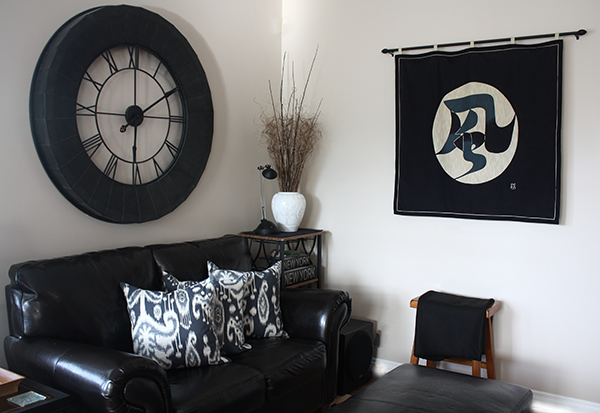 I never really loved the colour, but at the time it fit my decor. Shhhhh, hush with the gasps! Well, all that has changed. My less-than-a-look has turned into a look-for-less by using up part cans of spray paint, first a primer and then a gloss. If I wasn’t using up paint I had on hand I probably would have opted for matte instead of gloss, but in the end the high gloss isn’t so bad. 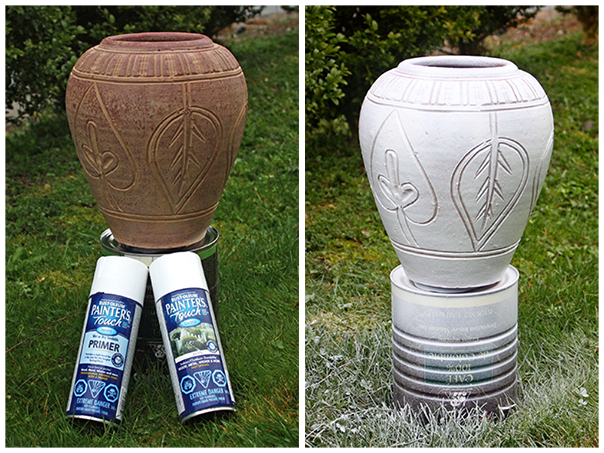 I didn’t go out and buy anything for this makeover, and it took me about an hour from start to finish – most of that time was spent ‘watching the paint dry’ as they say! I know the lines may not be exactly classic Mid-Century, but I’m okay with that for this faux variation. How about you? What knockoffs have you DIYed lately?